How can professionals maintain or improve the quality of care they provide when pressured by payers to reduce the cost of care? Clinicians today face the challenge of providing optimal care in an environment where costs drive clinical practice. But high quality, not cost, remains the goal of professionals. By arming themselves with measurable results, clinicians can improve the processes of delivering mental health care and translate those improvements into better outcomes for patients and their families. 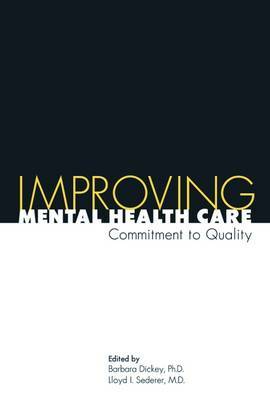 In this timely guide, the editors have gathered the work of 49 distinguished contributors and crafted a valuable resource for overcoming the extraordinary challenge of delivering high quality mental health care. This groundbreaking book is divided into three sections: The challenges today's clinicians face in providing optimal mental health care -- Beginning with a review of the report to then-President Clinton from the Advisory Commission on Consumer Protection and Quality in the Health Care Industry, subsequent chapters discuss professional ethics and managed care, how Wall Street investors are changing the practice of medicine, problems faced by managed care, and changes needed in medical education to ensure that physicians are well prepared to practice medicine in the 21st century. Proven techniques for quality measurement -- Measuring quality of care presents significant conceptual and methodological problems. These chapters review quality measurement methods and describe support by the federal government to improve these methods. Also addressed are how consumers are joining the quality of care measurement movement and how one large urban county mental health program is advancing quality measurement. Fourteen case reports of quality improvement projects -- These chapters detail principles and techniques that can be replicated or tailored to fulfill the requirements of a variety of clinical settings, ranging from the national health service in Great Britain to a small geriatric unit in a large hospital. The work showcased here was done by clinicians or administrators who, concerned about the quality of care in their own settings, used data to test for themselves whether their interventions resulted in improved care. Even if managed care disappeared, we would still need to question, examine, and improve the quality of patient care -- with clinicians taking the lead, because only they can appreciate the subtle nuances that maintain or improve quality standards, and only they can make substantive changes in their clinical settings. As both a broad conceptual framework for considering the quality of mental health care and as a practical field guide to real-life techniques for measuring the quality of care, this volume will prove exceptionally valuable for mental health care professionals, administrators, and policymakers as well as for consumers and consumer advocates, researchers, students, and public health professionals.
" "Improving Mental Health Care" provides a good introduction to the multiple roles that clinicians and managers can adopt to improve care." -- "Alexander S. Young, M.D., M.S.H.S., Psychiatric Services", "November 2002"
" "Improving Mental Health Care" will appeal to a broad audience. It provides both practical guidance and encouragement to anyone interested in systems change and the possibilities for improving care in a difficult practice environment. In a time of brooding pessimism and dangerous passivity, it provides an antidote and a practical model for moving forward into the coming era." -- "Michael Bennett, M.D., Journal of Clinical Psychiatry", "April 2003"